oh, dashi. it all starts with the dashi. you can use ajinomoto dashi granules, which are cheap, super easy to use, and have pretty dang good flavor for an instant stock. as you might expect, the best choice is to make your dashi from scratch, while involves boiling and straining katsuo-bushi (dried, smoked flakes of japanese skipjack tuna) over a relatively long period of time. i won’t go into the details here, but trust me, the flavor is far superior. chop your garnishes. slice the base off of your green onions, fold them in half twice, and chop them as finely as you can. most fried tofu comes in large blocks, which means you’ll need to cut it into a shape you find appetizing or easily perched on top of soup. 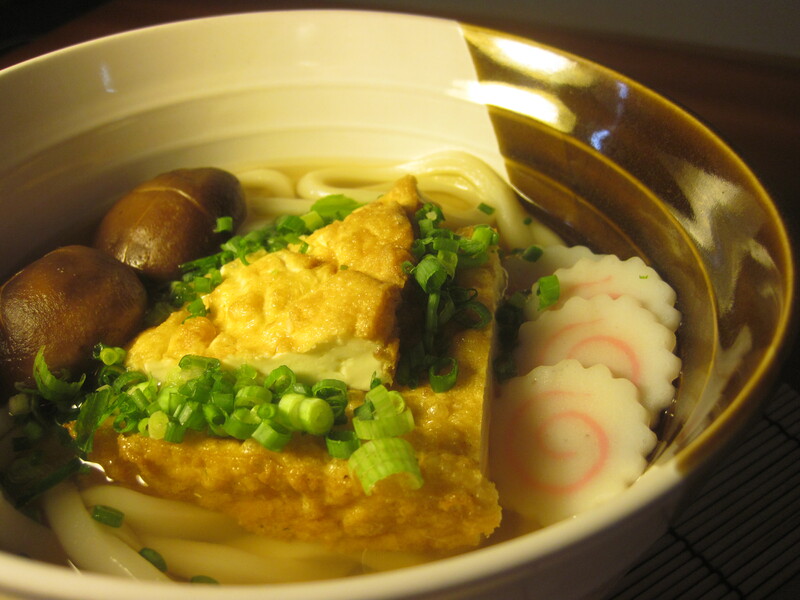 most udon shops cut the block diagonally, creating two traingles of tofu that are layered in the middle of the bowl. i find that this method looks the best, but i’ll leave it up to you. slice your naruto-maki. these little guys are absolutely delicious, but do you best not to overdo them. five or six thin slices is probably the most you will ever want in your udon. remember, they are a garnish and an accent flavor. too much fishiness can bring the freshness of the whole dish down. wash your shiitake, cut off the stems, and make an x-shaped incision on the head of the mushrooms. bring some water to a strong boil and drop in the mushrooms stem up. wait thirty seconds. if you did it just right, the mushrooms will swell, exposing the white color of the interior of the mushroom. this white x on the brown head of the mushroom is understated, but beautiful. make yourself about two cups of dashi. bring the dashi to a bowl in a pot over high heat, and then bring the heat down until it reaches a very mild simmer. add two splashes of soy sauce and an equal amount of mirin. give the broth a taste and see what you think. if it needs more salty, add more soy sauce. if it needs more sweet, give it another splash of mirin. put in your udon. if you use frozen udon, it’ll obviously take a littler longer, but if you buy the pre-boiled stuff, you only have to keep it in there for a few minutes. make sure not to over cook the noodles or they will be literally impossible to eat with chopstick without them falling apart. move the noodles into a deep bowl, and then ladle as much of your broth as you want on top. i tend to go on the broth-heavy side, but to each their own. decorate. i generally sprinkle the green onions in the middle of the bowl and then top them with the fried tofu triangles. then, i arrange the slices of naruto-maki and shiitake on opposite sides of the bowl. serve to your dinner guests and watch them marvel at the simplicity and the heartiness of udon.